Our full-hook up campground provides water, sewer, and electric at each site. Each site is set up with a fire pit and a picnic table. We have 31 full-hook up sites. We also have a primitive are. 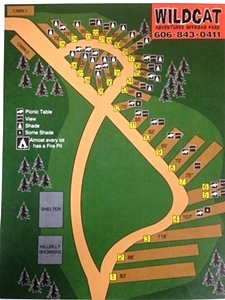 If you are interested in a camp site we recommend you call ahead and reserve your site. If you plan on cancelling to get a full refund you must call 7 days in advance, otherwise there is a $25.00 cancellation fee. Primitive sites: $20.00 per night.